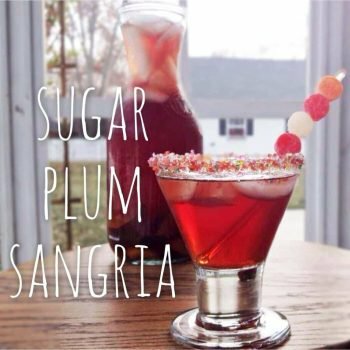 sugar plum sangria! such a fun and festive christmas cocktail! 6-8 t. Amaretto - taste after 6 t. then add more if desired. Other dried fruits can be substituted. Garnish such as gumdrops - opt. Combine all except the Rosa Regale and the garnish. Refrigerate the plum juice mixture overnight or at least 2 hours. Refrigerate the Rosa Regale overnight or until cold. When ready to serve, add the Rosa Regale to the Plum Juice mixture and stir gently. Dip the rims of the glasses in Amaretto and then in sanding sugar or pearl sugar. Pour the sangria into ice-filled glasses and garnish with a fun garnish like gumdrops.